Regan Schenck capped her senior season as a first-team all-KingCo 4A player in soccer and basketball. She was the league’s assist leader as a point guard in hoops and ranked second in KingCo in goals scored as a midfielder. It took some time for Regan Schenck to accept the finish to her athletic run at Woodinville. That’s understandable considering her final game was a 31-point state championship defeat against Spokane’s Class 4A basketball power Central Valley. But the performance couldn’t overshadow the accomplishments of the two-sport star. 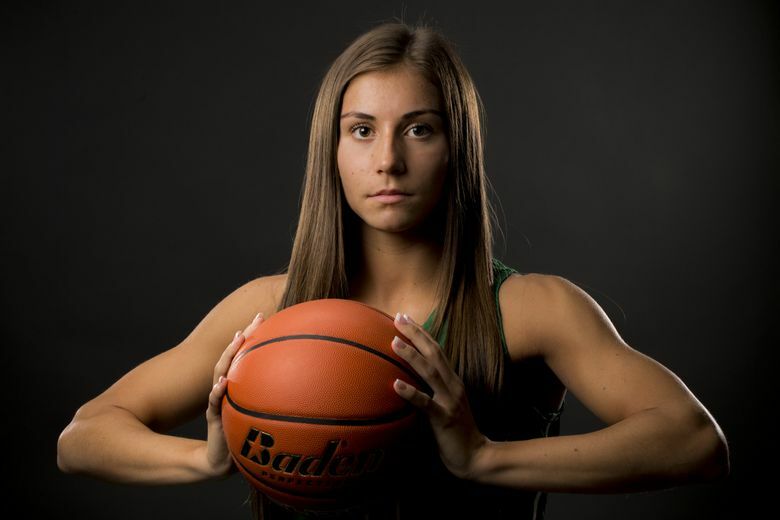 Schenck capped her senior season as a first-team all-KingCo 4A player in soccer and basketball. She was the league’s assist leader as a point guard in hoops and ranked second in KingCo in goals scored as a midfielder. Woodinville’s second-place finish at state was the best in the history of the basketball program. The Falcons’ soccer season ended with a third-place finish in the KingCo 4A tournament after she led the team to the second round at state as a junior. For her achievements, Schenck is The Seattle Times’ Female Athlete of the Year. “It was a crazy year,” she said. “In basketball, we went super far and it being my senior year made it that much sweeter. With soccer, we had a new coach, so everything was different and it brought the team closer because we knew we had to all stay together. Schenck playing soccer this season was a feat in itself. She opted to quit club soccer before her junior year in order to focus on developing her basketball skills in hopes of getting a college scholarship. Despite being one of two non-club players on the Falcons’ squad, Schenck scored 18 of Woodinville’s 37 goals and assisted on five last fall. Those totals were the second-most in KingCo 4A this season. Cutting back on soccer paid off, with Schenck signing to play basketball at Northern Arizona. She picked the university in part because of coach Loree Payne, who is in her second year with the Lumberjacks and who played on the University of Washington’s Elite Eight team in 2001. Schenck led KingCo 4A basketball in assists at 8.4 a game and broke the school record for assists in a season (214) and career (661). Having Mia Hughes to set up helped because the freshman averaged 19.3 points on 61 percent shooting. “Regan was always an impact player,” Woodinville girls basketball coach Scott Bullock said. “But she definitely improved tremendously from her freshman year. From a player who depended on her athleticism and speed, which can only get you so far, she turned the ball over a ton and tried to run people over. Woodinville won back-to-back KingCo tournament titles under Schenck’s leadership. She credits playing with four other seniors for the successful run, including winning three consecutive games in overtime in the Tacoma Dome to advance to the title game. Schenck was scoreless and committed six turnovers against Central Valley, but will be remembered for never quitting in the game featuring Stanford-bound twins Lexie and Lacie Hull.